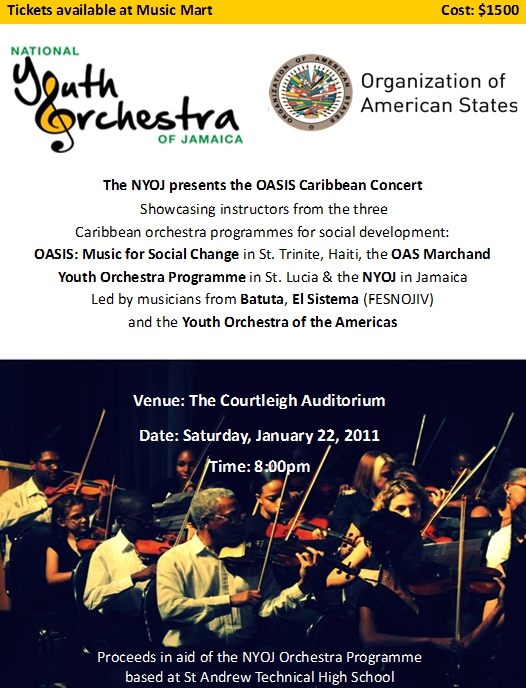 The National Youth Orchestra of Jamaica will be performing on Saturday, January 22, at the Courtleigh Auditorium, at 8 pm. This concert marks the closure of the Regional Training Workshop ‘Music for Social Change’, which has brought together instructors and directors from the three Caribbean orchestra programmes for social development: the OAS March and Youth Orchestra Programme in St. Lucia, OASIS: Music for Social Change in St. Trinité, Haiti and the Jamaican NYOJ. 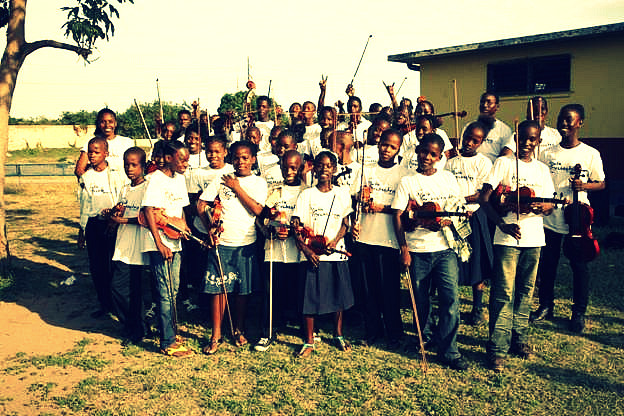 Each of these programmes has emerged out of a radical OAS (Organization of American States) anti-crime initiative and share the common goal of engaging at-risk youths in intensive classical music training. The concert will showcase instructors from the three Caribbean orchestra programmes for social development, who will be joined by all the Latin American workshop instructors and coordinators that have helped to make this workshop possible. The workshop directors are pivotal Latin American participants of musical social change projects in their respective countries and will use this regional training week to share their methodologies with Caribbean instructors. Some of the Latin American workshop instructors are: Jorge Arbeláez, the academic director of Batuta in Colombia, and author of their teaching methodology; Nicolás Giordano, a member of the Youth Orchestra of the Americas (YOA) since 2003 and founder of the Uruguayan Musical Seminar NGO Sembrando Talentos; and Martín Benvenuto, an Argentinian national, artistic director of Peninsula and Women Sing, and leading choir conductor in the San Francisco Bay Area. The remaining workshop instructors include talented musicians from FESNOJIV in Venezuela (better known as the world renowned El Sistema orchestra programme) and Batuta in Colombia. The concert will be a spectacular melding of international classical prowess with a programme full of sophisticated compositions from inspiring international musicians. Tickets for the concert are available at Music Mart or from Beatriz Pozueta via email at beatrizpozueta@yahoo.com. The cost of the ticket is $1500. All proceeds from the event will be in aid of the NYOJ orchestra programme. Glad to see that these children are being put in a musical program. Music is the delight of our lives so it’s important for our children to know the language of our instruments.